Like Chocolate for Women. 53 Shades of Chocolate. Are they not the best book titles ever ? These ladies are geniuses I tell you. Well hold onto your undies, because I am giving away both books and sharing some chocolate love with you. Many thanks to the lovely Kim Morrison for sharing. I can’t tell you how much this lady inspires me. From when I first read Like Chocolate for Women (many years ago now), to signing on as her affiliate partner and watching her fabulous life unfold on my Facebook feed, this lady encourages me to do better every single day. Now, let me tell you about both books before we get onto the recipe. 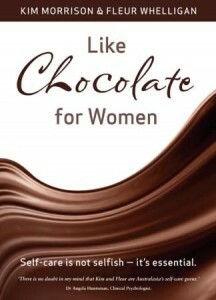 ♥ Like Chocolate for Women is the ultimate self-care bible. Written by Kim and the gorgeous Fleur Whelligan, this book takes you on a journey of self- love. From beautiful aromatherapy rituals to healthy recipes to learning how to drop the guilt and pamper yourself, these ladies have it all covered. It feels like two best friends guiding you gently to a better life. I refer to it often and my copy is looking well-loved now. You can get it online from Kim here. ♥ 53 Shades of Chocolate is a chocolate lover’s dream come true. 53 healthy chocolate recipes! What is not to love? This book is available for immediate download and it’s cheaper than a box of chocolates! Written by Kim with the gorgeous Cyndi O’Meara (nutritionist at Changing Habits), it starts at breakfast and goes through to drinks, slices, cakes, desserts, biscuits and dips. 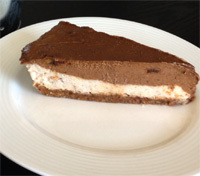 It includes raw, gluten-free, dairy-free and thermomix-friendly recipes. You can get it online from Kim here. Okay, now that I have told you how good they are, you can test it out yourself with this amazing recipe. It seems wrong that something so good can be healthy, but that is where the genius factor comes in! by Kim Morrison and Cyndi O’Meara from 53 Shades of Chocolate. 1. Place all base ingredients into TM on speed 10 for 5 seconds. 2. In a spring form round tin, press the mix into the base firmly and evenly. 3. Wipe out the TM and add all the ingredients for the middle layer. Blend on speed 8 for 10 seconds until smooth. 4. Pour this mixture into cake tin and spread evenly. Place tin in freezer to set the layer. 6. Meanwhile add the top layer ingredients into the TM and blend on speed 8 for 10 seconds until smooth. 7. Add this mixture to the tin and smooth to create a nice clean and even surface. 8. Garnish with some fresh fruit or berries. 9. Pop back into the freezer and leave to set for a couple of hours. This will make it easier to slice and serve. If you don’t have a thermomix, your food processor and blender can be used in place of the thermomix. This giveaway runs from now until Wednesday the 29th of May at midnight (AEST). The winner will be drawn using random.org, emailed and announced on this blog post from those meeting the entry requirements. Sorry, only available to those with an Australian address. Enjoy the cake and please let me know if you try it and what you think. Anyone else a chocolate tragic like me? I am loving the look of the chocolate packs – making my own healthy chocolate, no better indulgence!!! The orange chocolate pack particularly draw me – yum!! The chocolate ultimate pack looks amazing! Oooh, The Chocolate Ultimate Pack – make your own chocolate. How decadent and to add a different twist you can add different oils to flavour. Whenever someone says ‘chocolate’ I’m there! The “About Face” book looks pretty cool! The chocolate peppermint pack – yummo! 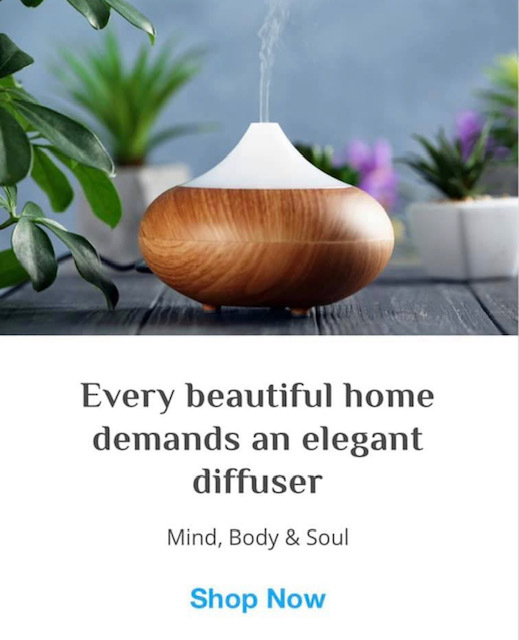 The synergy oil blends look lovely. As for the chocolate. ..peppermint. yum! definitely the chocolate peppermint pack…the kids and hubby don’t like it, so all for me!! These 2 together and i’m in heaven yummmmm! The “I am woman pack” looks good. Or one of the chocolate packs. I saw a video using the cacao wafers and the thermomix to make healthy chocolate. I’m seriously considering getting a thermomix and its something is love to try out. The chocolate ultimate pack definitely!! Have been following these ladies on their podcasts, on HCG protocol at the moment but soon would like opportunity to use these amazing products with the recipes. Yum! The body boost packs look great, wouldn’t know which one to get though! you can do either – both are yummy!! Can’t wait to try that yummy recipe. I would really love to read the books. I do love their magnesium spray and the celebrate and uplift oil. So good! Thanks. Chocolate packs look good but glad to find another source of rapadura! Definitely the ultimate chocolate pack! Would love to make my own chocolate! WOW!!! a ’28 day Like Woman for Chocolate Programme’ sounds to good to be true!! Sounds very interesting & yummy! Aromatherapy Starter Kit – Sounds like the perfect way to get my body balanced both inside and out! The clay treatment mask or the ultimate chocolate pack look great! I’d love to win these books and make your cake. I love to give the 28 day like chocolate for women program ago and the aromatherapy oh and the chocolate lime pack. Omg omg omg! I really wanna win this!! I’ve purchased her skin care and aromatherapy starter pack, both all used up and haven’t saved enough money yet the purchase again! But wanting to do so in the future’ And I haven’t purchased the book yet for myself, I just bought the book for my mum for Mother’s Day but she’s in another state than me and I really want a copy for myself! I’m a huge fan of Kim’s I listed to up for a chat and follow her on fb! 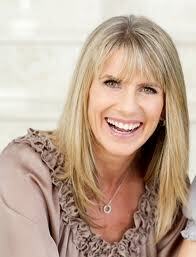 Can’t wait to meet/see her at the wellness summit in aug! The Clay Treatment Mask looks amazing!! 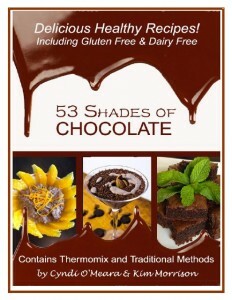 I love the 50 Shades of Chocolate book. It sounds yum! How fantastic to have Thermomix and non thermo recipes. The about face book on kims websire sounds great ! 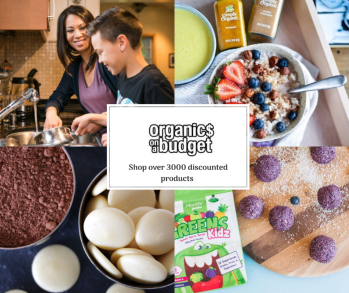 I’m so glad I just clicked on this link, so many great products! Going to have to try the coconut mint lip balm and the body packs sound great cant go past age defying pack. I love the orange chocolate pack, such a beautiful taste and very addictive. The Lavender essential oil sounds divine. Well all the products sound wonderful. Chocolate. Cyndi’s all natural seaweed salt is a highly nutitional addition to any meal! I love using seaweed salt. As if you would go past the Ultimate Chocolate Pack………yummo!!! What a great website… full of fantastic things. I have bookmarked. The 28 Day Program Download caught my eye. Chocolate is my addiction. Besides the 28 day program .. which sounds great! I love the sound of the chocolate lime pack! Chocolate Peppermint Pack: After a healthy meal, I’d love to finish off with a choccy after dinner mint, peppermint aids digestion too… so Win-Win! The only thing better than chocolate, is chocolate AND peppermint. The chocolate peppermint pack looks so good!! The aromatherapy healing kit sounds great to me. Just what I need right now! Wow, that recipe looks amazing and definitely going to attempt! I always have my eye on one of the body boost packs – any in the range as they all sound beneficial! The dark chocolate goji berries sound unusual. There are lots of lively chocolatey things on the list. Being dairy free, these chocolate alternatives make my heart sing! I would love to try the ultimate chocolate pack. But the chocolate berry book pack looks pretty good too. The mousse cake sounds wonderful, but alas no Thermomix and my food processor has died, I’ll just have to imagine how good it is. Wow everything looks fantastic…but would love to try the choc orange pack. The aromatherapy oils look really good too! Body Boost Pack – Destress and Revive sounds pretty good to me right now! 🙂 awesome comp thanks a bunch. Hard to go past the ultimate chocolate pack…..yum!! I don’t know where to start. I love the ultimate chocolate pack, loving the oils. I think I have just found my new favorite online shop! I’m intruiged by the cacao wafers. Would love to give them a go in some foodie ideas. Ooo the ultimate chocolate pack looks great!!! I’ve been after some good quality peppermint oil for a little while, now! So many fabulous things, but Cyndi’s Cacao Wafers really caught my eye. Oooh the choc orange pack sounds fab! I love the synergy oil blends, and the one I would like to buy next is the Celebrate and Uplift blend. Thanks for arranging such a great giveaway. The chocolate ultimate pack looks sensational! Seriously anything! It all looks great from the chocolate packs,( I have not tried the cacao wafers yet), to the coconut oil and essential oils! Would love to add Changing Habits Changing Lives Cookbook to my collection. I like the look of the chocolate ultimate pack! I’ve been wanting to make my own peppermint & orange chocolate but also like the idea of using these oils in my homemade bliss balls!! Yummo!! Im really glad I had a look around! You have recruited another follower, both of you! That coconut oil isn’t just for mediterraneans! I have to choose? Any eshop that has a whole category of products simply labelled `chocolate’ is wondrous in my book. LOL. Wow I’m so excited Cyndi I always love your books. But very excited that one is gluten free, dairy free and thermomix. That is a combination I work with everyday in my kitchen! I love all of the Essential Oil Synergy Blends – I own 2 already, but want the set. Ohmygosh. The dark chocolate goji berries would be delicious. Hard to pick just one thing though! 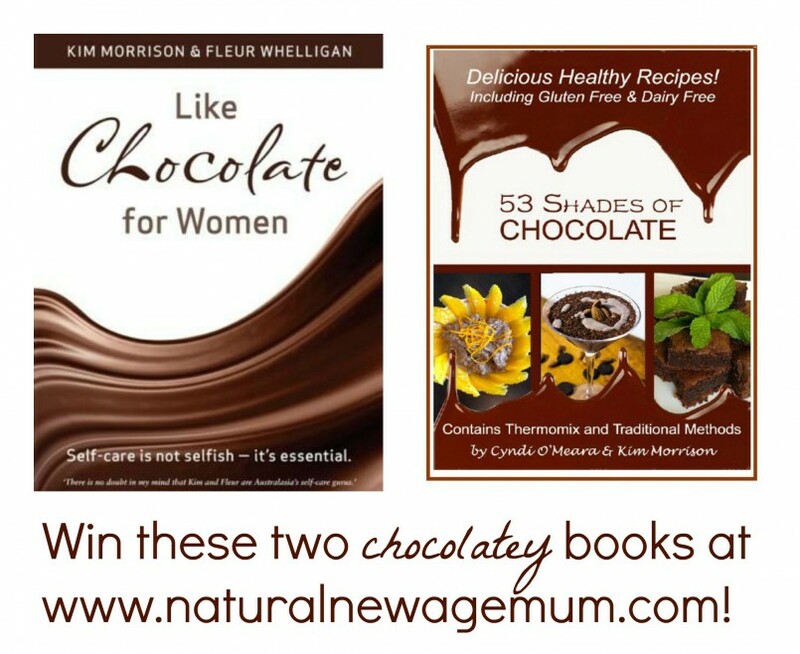 I’m a huge fan of the Twenty8 skincare and would love to win the books – who doesn’t love healthy chocolate?! The Chocolate Peppermint pack is definitely on my shopping list!! Oh my goodness the chocolate peppermint pack and the choc orange pack are hard to come between 🙂 Yummmy! The Chocolate Peppermint Pack looks great. I could make my own chocolate and have it all to myself because hubby doesn’t like peppermint chocolate! I just love that new choc website. Thanks for the heads up on it! I can’t wait to get my hands on the choc orange pack, but then again I have every intention of trying the dark choc Goji berries as well. The possibilities of what can be made with these delightful products are endless 🙂 Thanks again! De-Stress And Revive Synergy Blend sounds like it would be well utilised in my house!! Chocolate orange pack – Yum, I love anything that has the words chocolate and orange in the title! The ultimate chocolate pack would be fantastic & a piece of that cake would be perfect for an afternoon snack. Yum! Chocolate ultimate pack- yes please!! I love the HCG Oil Free Skincare range. And the other aromatherapy products. 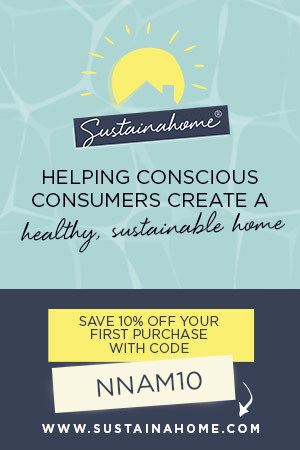 I’m a big fan of using natural beauty products and had never heard of this website before. Thanks for leading me to Twenty 8. I like the look of the chocolate ultimate pack! I am new to raw foods and am very excited. The books look excellent. 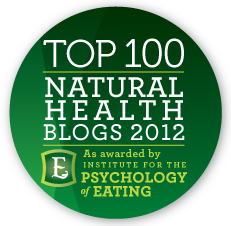 Well wow it all sounds so wonderful, nothing like great chocolate to nourish body, mind and soul. The Ultimate Chocolate package sounds amazing. Yum! The chocolate packs look great…can’t wait to make my own choccies! Oh I love me some essential oils!!! Your Aromatherapy Synergy Kit looks completely yummy! I like the sound of the Body Boost Pack – Destress and Revive.